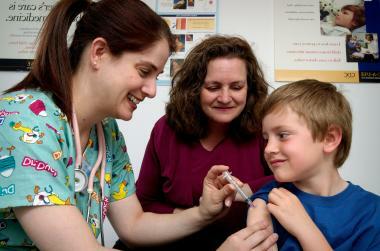 With school just around the corner, it’s time to schedule your child’s chickenpox vaccine. The chickenpox vaccine (also known as the varicella vaccine) is a preventive measure taken to boost the immune system against the varicella virus that causes chickenpox. The chickenpox vaccine contains a weak strand of the virus that is less virulent and typically incapable of causing the disease. It does, however, cause the immune system to react as though it has the virus, which helps to aid in your child’s immunity and protection against the stronger viral pathogen. Chickenpox is an uncomfortable disease and is typically spread person-to-person through the air. In 2016, it’s estimated that four million people will catch this disease in the United States alone. That’s why it’s important for parents to schedule the chickenpox vaccination for their child as soon as they are old enough. There are two separate doses of the vaccine that should be administered to your child, which together make your child 98% immune to the virus. If your child experiences any other reaction, especially one more severe, contact your healthcare provider or a medical professional. For more information about the chickenpox virus, contact your local FastMed Urgent Care. Our healthcare professionals are committed to providing compassionate care that is both quick and affordable. We also accept most major insurance plans, including Medicare and Medicaid.